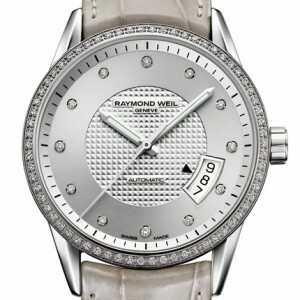 Raymond Weil creations are so sophisticated and polished. The look is that of the highest quality, and that is what you get. Their newest edition to their line of women’s watches is no exception. The Freelancer Summertime is a fantastic blend of modern styling and Swiss quality workmanship. These ladies timepieces speak to the chic woman, luring her in with magnificent design elements. These are automatic mechanicals, crafted with 25 rubies, for precision accuracy. They carry a power reserve, when fully wound of 38 hours. They are made well, and built to perform, but the appearance is the clincher. The Freelancer Summertime is a monochromatic blueprint. It offers layers of various textures and materials, which add up to an interestingly stylish interpretation. The center of the dial is a steel waffle pattern, which transforms to a smooth brushed finish, on the outer rim of the dial. This area is set with diamonds to serve as hour markers. The bezel is in a polished steel and also set with brilliant diamonds. The bracelet on the Freelancer Summertime is presented in a neutral toned alligator strap, which has been meticulously saddle stitched. 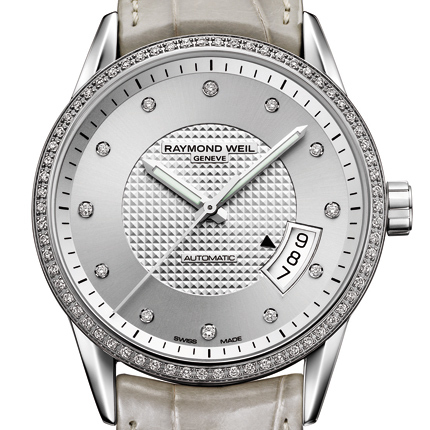 Raymond Weil creations just keep getting prettier and more stylish!